CF-WR302S is built in dual Realtek Chipset, which ensure the strong signal from the CPU. 3. Enter the default password ""admin"" and click the ""login""
boost the speed of your original router or hold the same speed of the original router. It means that it's wifi speed may be weakened compare with your router. 2. The distance that WiFi signal can extend, is depending on the distance among router, repeater and WiFi users. So controlling the distance between repeater and router, then you can control the distance that WiFi siganl can extend. 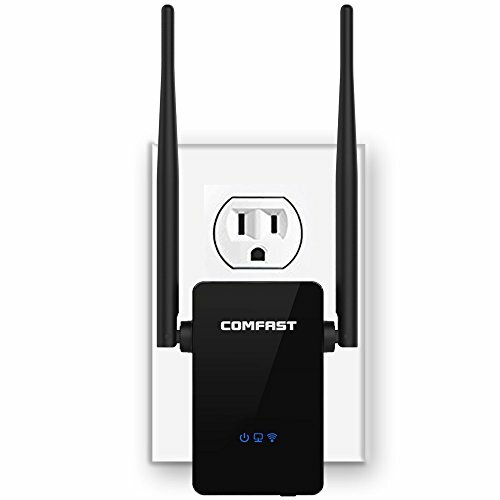 Boost WiFi Coverage: The Wifi repeater with 360 degree WiFi signal covering can extend your existing Wi-Fi coverage to long distance and create a stronger signal in hard-to-reach areas. The signal distance will be reach 160㎡ without obstacles. 3 in 1 function: Repeater/Router/AP Mode. Compatible with any wireless network, router and Wi-Fi enabled devices including Smartphone, iPhone, iPad, Tablet, Laptop, Desktop, Smart TV, TV BOX, etc. High performance: Dual high-gain 5dBi external antennas enhance wireless signals for stable data transmission. Reliable wireless network speed up to 300Mbps covering your bedroom, floors, restroom, garage, basement and garden. Built-in dual Realtek chipset ensure strong signal from the CPU. Strong signal can go through very well and penetrate walls. Easily expand wireless coverage, accessible from almost any device, including iOS and Android mobile platforms. If you have any questions about this product by COMFAST, contact us by completing and submitting the form below. If you are looking for a specif part number, please include it with your message.